The function of the healthy heart is to pump blood continuously through the circulatory system. The pumping action delivers blood that is oxygen and nutrient rich to cells in the body. Proper nourishment to these cells is necessary for the body to function normally. Heart failure means the heart is not able to pump effectively to supply the cells with enough blood as the heart is weakened. This is considered to be a chronic and progressive condition. The following is heart failure stages with symptoms and treatment options associated with each stage. Although there is no cure, it is still possible to have good quality of life if the condition is managed appropriately. 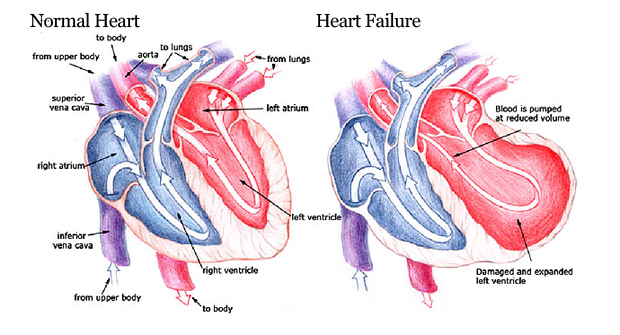 The following picture shows the differences beteewn a normal heart and a heart suffered from heart failure. The left ventricle is damaged and expanded while the blood is pumped out of the heart at a reduced volum. Those at stage A congestive failure are at risk of developing heart failure or pre-heart failure, including people with high blood pressure, diabetes, metabolic syndrome, coronary artery disease, history of cardiotoxic drug therapy, history of alcohol abuse, rheumatic fever or cardiomyopathy. Treat hypertension (high blood pressure). Quit illegal alcohol or drug use. Use ace inhibitors (For those with a history of a heart attack, diabetes, high blood pressure or other vascular or cardiac conditions). Takebeta blockers (For those with a history of a previous heart attack or have hypertension). Patients at stage B congestive failurehave heart disease related structural defects with the risk of developing heart failure, including patients with a history of a heart attack, cardiomyopathy or valve disease but no signs or symptoms of congestive heart failure. Those with an ejection fraction of less than 40% are also at risk. All treatments of stage A. Prescription for an ACE inhibitor and beta blocker for all patients. Surgical options for coronary artery disease and valve replacement or repair, if necessary. Patients at stage C congestive failureare diagnosed with heart failure and have current or previous symptoms which may include: difficulty breathing, Fatigue and apoor tolerance to exercise. All patients to take ACE inhibitors and Beta Blockers. Diuretics and Digoxin may be prescribed if the symptoms persist. Aldosterone inhibitor when the symptoms continue to remain severe despite other treatments. Restriction of sodium (salt) in the diet. Restrict intake of fluids if necessary. Discontinue drug therapies that worsen symptoms. Some patients benefit from use of other prescriptions such as nitrates or hydralazine. Biventricular pacing or defibrillator maybe implanted. Among heart failure stages, the last one is stage D or end stage congestive heart failure. Patients at this stageare diagnosed with heart failure and are experiencing advanced symptoms despite optimal medical care. Below is a closer look at the symptoms associated with this late stage of disease. Severe breathingdifficult, especially when lying flat. Even with the head of the bed elevated a patient may still suffer. This is related to the congestion in the lungs caused by excess fluid accumulation. Excess fluid retention leads to swelling in all parts of the body, especially the legs and abdomen. Swelling in the legs is evident from the groin to the toes, making it difficult and painful to wear shoes. Accumulation of fluid in the abdominal cavity causes an increase in the girth and roundness, making it difficult to tolerate any clothing other than loose garments. In late-stage heart failure, the heart cannot maintain a normal heart rhythm which worsens the ability to pump blood to the body’s cells effectively. In some cases, patients elect to have an electrical device implanted to stimulate the heart muscle. Unfortunately, for most patients these changes in the heart performance are not reversible. Due to existing heart disease, approximately 50% of patients will develop kidney failure or insufficiency. When the kidney malfunctions, it worsens the accumulation of fluid and overloading of the heart. This is very serious and a sign that death is impending. All treatments for above heart failure stages can be used. Besides, patients will also be evaluated by a healthcare provider to determine if treatments such as a heart transplant, ventricular assist device, other surgical options, research therapies, continuous infusion of intravenous heart medications and end of life care (hospice or palliative) are available options. Weight changes resulting in a gain of more than 2 pounds in a day. Shortness of breath that suddenly worsens. A decrease in urination, or no urination at all. Development of a rapid heartbeat. Confusion that is worsened or not “normal” for the patient. How Does Congestive Heart Failure Affect Us? The terms heart failure and congestive heart failure are sometimes used interchangeably.When the amount of blood flow out of the heart begins to slow, blood returning to the heart via the veins begins to back up, causing congestion in the body’s tissues. 1. How Does the Heart Makes Up for Congestive Heart Failure? Enlarge: The heart chamber will enlarge so it can contract stronger to pump more blood. When this occurs your body begins to retain fluid, your lungs can become congested with fluid and the heart will begin to beat irregularly. Increase muscle mass: The contracting cells of the heart get bigger, thus increasing the muscle mass. Initially, this allows the heart to pump more strongly and faster to increase its output. Blood vessels narrow to increase the blood pressure to make up for the heart’s lost power. Blood is diverted away from less important organs and tissues so blood flow can be maintained to the most vital organs such as the heart and brain. These temporary methods of compensation only mask heart failure, not solve it. The heart failure continues and worsens until these methods are no longer effective. 2. What Are the Symptoms of Congestive Heart Failure? Your healthcare provider can do a thorough assessment and necessary testing to determine if a diagnosis of heart failure is to be made. Based on these results, you will be associated with a particular congestive heart failure stage and treated accordingly.